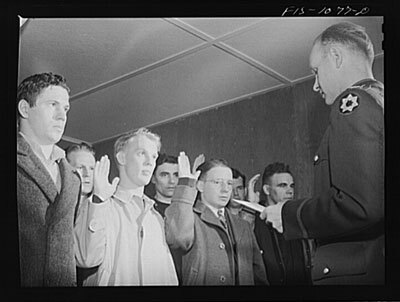 World War II recruits take the oath. World War II was the watershed event of the 20th century. It exacted the highest human toll in the history of warfare, and it changed the world’s political, social and economic landscape forever. This fall, Ramsey County Library will present a series of programs on World War II and its lingering influences at the Roseville Library, 2180 N. Hamline Ave., and the Maplewood Library, 3025 Southlawn Drive. Beginning Thursday, Sept. 19, at 7 p.m. at the Roseville Library, Professor Paul Solon of Macalester College will lead a three-month book discussion series on three of the most important works about the war: E. B. Sledge’s With the Old Breed: At Peleliu and Okinawa (Sept. 19), Max Hastings’ Inferno: the World at War (Thursday, Oct. 17, at 7 p.m.) and Kurt Vonnegut’s Slaughterhouse-Five (Thursday, Nov. 7, at 7 p.m.). The library has extra copies of these books available for checkout. The library is also collaborating with the Osher Lifelong Learning Institute of the University of Minnesota to present a series of talks at the Roseville Library. The first two talks will begin in September. Tod Worner will present “Titan of World War II—Winston Churchill” on Sunday, Sept. 22, at 2 p.m. Dennis Kane will present “Mind Play: Deception in World War II,” a talk about code-breakers, spies and real-life secret service agents, on Sunday, Sept. 29, at 2 p.m. The Maplewood Library will present a program on how to trace your World War II ancestors on Tuesday, Oct. 15, at 7 p.m., and a series of World War II movies on Friday, Oct. 11 and Nov. 8, at 10 a.m. To find out more about the programs, go to www.rclreads.org. Next PostDo you recognize this World War II soldier?